Southeast Asia is home to the world’s smallest bear species, the Malayan sun bear. These little bears face big threats throughout their range, especially from forest destruction, illegal hunting, and the capturing of small cubs for pets. Luckily this unique bear has a champion and protector in Siew Te Wong, a Malaysian researcher and Ph.D. candidate at the University of Montana. Woodland Park Zoo has helped support Wong and his field work in Sabah, Borneo for several years. 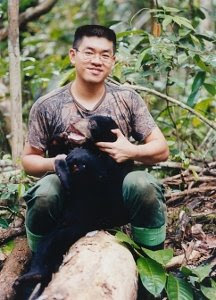 As one of the very few people studying the sun bear, Wong has uncovered many fascinating aspects of sun bear ecology. Sadly, though, his research also brought him first-hand experience of the inhumane treatment of sun bears kept as pets. Wong’s deep concern for these animals has inspired a new and ambitious project: the creation of the Bornean Sun Bear Conservation Center, a partnership between the Sabah Wildlife Department, the Sabah Forestry Department and nonprofit LEAP (Land Empowerment Animals People). The center will rehabilitate and release suitable ex-captive bears back into the wild, provide an improved long-term living environment for captive bears that cannot be released, and educate local people about the species. The project is endorsed by the Association of Zoos & Aquariums Sun Bear Species Survival Plan. 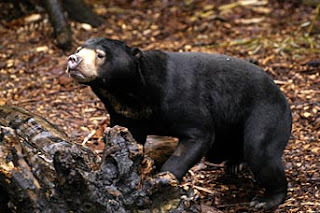 Read Wong’s field blog to learn more about sun bears in the wild. And you can also visit sun bears at Woodland Park Zoo. Humboldt penguins nest in poop. In the wild, Humboldt penguins dig their nests into guano, the accumulated droppings of sea birds. These nesting burrows protect eggs and chicks in the unique yet unforgiving desert environment that is Punta San Juan, Peru—home of Peru’s largest Humboldt penguin population, and the inspiration for Woodland Park Zoo’s new penguin exhibit opening in May. But this tidbit is important not just because it’s a great “Did you know?” to pull out at your next party, but because it’s also a significant factor in the conservation of this endangered species. You see, one of the greatest threats to Humboldt penguins is the overharvesting of guano as an agricultural fertilizer. Take away their nesting material, and penguins lose the ability to safely hatch eggs and add chicks to their already depleted population. To mitigate this threat, a guano reserve was created in Punta San Juan, overseeing the sustainable harvesting of this precious resource. 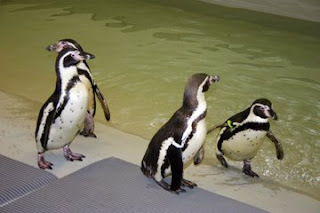 The Humboldt Penguins Conservation Center, which Woodland Park Zoo helps support annually, is currently trying to transition Punta San Juan from a supervised guano reserve to a true marine reserve. In addition to maintaining a protective seawall, the Center collects biological data and conducts educational programs within the surrounding area, increasing awareness of Humboldt penguin needs and marine conservation issues. When you visit the new Humboldt penguin exhibit at Woodland Park Zoo this summer, look for guano-topped rocks like the one pictured here and guano bags stacked next to a recreation of a working guano harvest area. Photos: (Top) Humboldt penguin chicks, photo by Patricia Maluf. (Middle) Bags of harvested guano are stacked high in Punta San Juan, Peru, photo by R. Scott Vance. 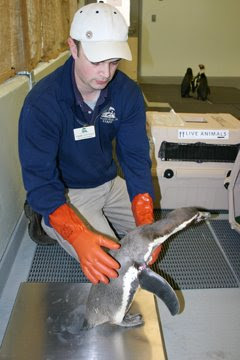 (Bottom) Guano-topped rock in Woodland Park Zoo’s new Humboldt penguin exhibit, photo by Ryan Hawk. When it comes to conservation, it takes a village. Just ask the villagers of Tapoh, Thailand. To help protect hornbills from poaching and deforestation, the Hornbill Research Foundation (HRF) in Thailand—a Woodland Park Zoo Partner for Wildlife—has been working closely with Tapoh villagers in the Narathiwat Province in southern Thailand to transition them into stewards of their own wildlife. The HRF employs local villagers and former poachers as nest guardians—guarding not only naturally occurring nests, but also constructing, installing and guarding artificial nests. Guarding nests is especially important because hornbills tend to nest in large-diameter trees, which, unfortunately, are the same type of trees that are felled to clear the land for agriculture or wood products. There’s good reason for the people of Tapoh to protect hornbills and their nesting sites: hornbills are seed dispersers, essential to the health of the forests upon which the villagers also depend. As of 2008, over 50 participating Tapoh villagers guard more than 240 natural, artificial and hybrid nests. There are now some 40 breeding pairs of the six species in Budo-Sungai Padi National Park, with increasing numbers of fledglings each year. And the former poachers? Now employed as guardians with sustainable income, they don’t need to return to poaching to make a living. Photos: (Top) Hornbill, photo by Tim Laman. (Bottom) HRF founder Dr. Pilai Poonswad leads a tour in hornbill habitat, photo by Eric Kowalczyk. 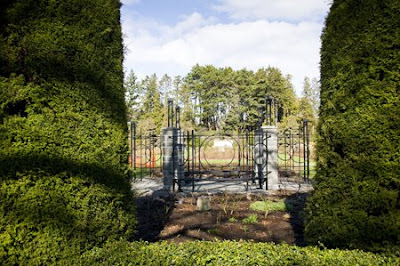 The famed Woodland Park Rose Garden, noted as one of 24 All-America Rose Selection Test Garden, has been a favorite local spot since it opened in 1924. Now, thanks to funding provided by the Seattle Garden Club and Committee of 33, a new pergola is gracing the south end of the garden. The pergola restores the traditional symmetry and north-south views to the landscape. 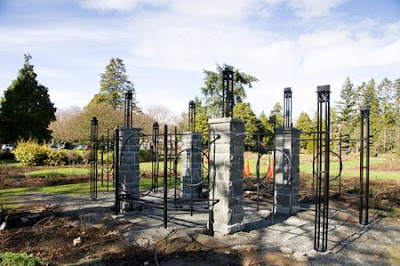 Constructed with wrought-iron and stone pillars designed to match the existing fence that surrounds the garden, the pergola will provide the capacity to grow varieties of climbing roses. Horizontal wooden slats from salvaged lumber will create an open "roof", providing further structure for roses. Built-in benches inside will allow visitors the ability to enjoy a view of the garden filtered through a canopy of flowering rose blossoms. Construction is nearly complete and roses will soon thereafter begin to be planted. Another new addition to the garden, less obvious but no less exciting, is that the Rose Garden is now 100% organic---no chemical fertilizers, herbicides or fungicides are used! The zoo's talented Horticulture Department is continually looking for organic and sustainable ways to care for the more than 100,000 plants, trees, flowers and shrubs that live at the zoo. Learn more about the rose garden on the zoo's website. We are thrilled to announce that Woodland Park Zoo’s Tree Kangaroo Conservation Program has helped preserve 187,800 acres of pristine forest habitat with Papua New Guinea’s first ever Conservation Area. That’s an area the size of all five NYC boroughs combined! After 12 years of work, Woodland Park Zoo and partner Conservation International have reached agreement with Papua New Guinea land owners and government to establish the YUS Conservation Area, named for the region’s three rivers, the Yopno, Uruwa and Som. The area will protect thousands of species—including the endangered Matschie’s tree kangaroo—and some of the most critically diverse habitat on the planet. Though the nation has declared protected areas in the past, this is the first of its kind to prohibit all hunting, mining, logging and development—a new level of commitment to conservation a decade in the making for the people of Papua New Guinea and Woodland Park Zoo. To learn more about the zoo’s road to this conservation milestone, read the full story at TKCP online. Want to play a part in this story? Woodland Park Zoo has received a matching challenge grant from Conservation International (CI) to establish a trust that will support the management of the Conservation Area into the future. We are trying to raise $1 million by 2010, which CI will then match for a $2 million trust. 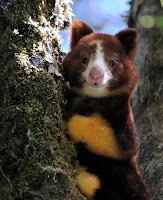 To donate, go to WPZ’s giving page and select the Tree Kangaroo Conservation Trust option. Photos: (top) Village and tropical forest near newly declared YUS Conservation Area in Papua New Guinea, photo by Toby Ross/Tree Kangaroo Conservation Program. 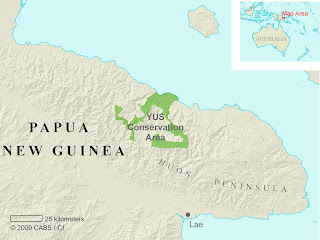 (middle) Map of the newly declared YUS Conservation Area on Papua New Guinea’s Huon peninsula, image by Tree Kangaroo Conservation Program/Conservation International. (bottom) Juvenile tree kangaroo in forest canopy, photo by Russell A. Mittermeier/Conservation International.